1833 - The Kirtland High Council met to re-hear the case against Doctor Hurlburt. He had been cut off for improper conduct with a female member of the Church. The decision of the Council was that “his crime was sufficient to cut him off from the Church; but on his confession he was restored” (History of the Church, 1:354). This same Doctor Hurlburt would later become a bitter anti-Mormon. 1834 - Colonel John Sconce and two other leading men of Ray County, Missouri, came into Zion’s Camp desiring to know their intentions. He stated that on the night of June 19th, he had led a group of armed men to destroy Zion’s Camp but that he had been stopped by the severe storm. He said, “I see that there is an Almighty power that protects this people.” The Prophet Joseph then related to him the sufferings of the Saints for their religious beliefs and that their intentions were to restore the people to their lands and to assist their brethren any way possible with clothing, etc. The Spirit touched their hearts and they agreed to use their influence to calm the fears of the people. Joseph’s prophecy that sickness would come upon the camp because of disobedience resulted in several brethren sick with cholera and the death of Thomas Heyes on this day. 1844 - Governor Ford of Illinois arrived in Carthage, Illinois, in the morning and immediately sent a letter to the Prophet Joseph informing him that he had heard some strong statements concerning the recent acts of the Mayor and City Council. He asked that a messenger be sent to him to lay out their side of the story. Mayor Joseph Smith then called for a meeting of the City Council at 4 p. m.. The City Council gathered the affidavits collected over the last few days and sent them to Governor Ford with Dr. J. M. Bernhisel and City Council member John Taylor. Additional affidavits were gathered to be sent the next day. 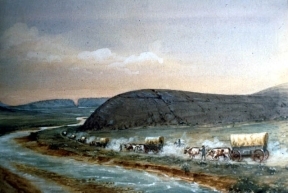 1847 - The first Pioneer company arrived at Independence Rock and took the time to look it over before moving on. About one mile below it they forded the Sweetwater River which was running high due to melting snow, making the crossing difficult. They then traveled to Devil’s Gate, camping one mile to the west on the banks of the Sweetwater River. 2000 - President Gordon B. Hinckley announced that Ricks College in Rexburg, Idaho, would become a four year university and be renamed Brigham Young University-Idaho. 2015 - The Trujillo Peru Temple was dedicated by President Dieter F. Uchtdorf of the First Presidency. Also, the first stake in Vanuatu is organized at Port Vila.